Even by President Donald Trump’s standards, his Tuesday speech at an NRCC event was completely off the rails. Here are the most bonkers tangents he traversed during the one-hour and twenty-eight minute barrage. 1) In an undemocratic turn, he urged Republicans to be “more paranoid” about vote tallies, especially when Democrats win. 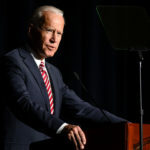 2) He implied that Sen. Bernie Sanders’ (I-VT) people are behind the accusations that have recently surfaced against former Vice President Joe Biden, as now four women have said that Biden was too touchy and invaded their personal spaces. 3) Bizarrely, he said that the noise from wind turbines causes cancer (it does not). “They say the noise causes cancer,” he said of wind farms. 4) As per usual, Trump demonstrated his affinity for jumping up and down on Republicans’ failure to repeal Obamacare, still clearly sore at the members of his party (read: the late Sen. John McCain) who had a hand (or thumb) in its defeat. “Someone’s gonna leak this whole damn speech to the media,” he bemoaned…into the C-SPAN cameras.